Searching WikiLeaks for documents about a particular topic, event or individual just got a little bit easier. The whistle-blowing site now offers a search engine where you can query its entire database of published documents for a specific phrase or keyword of your choosing. Just like Google, you can also refine the nature of your search for more accurate and focused results. 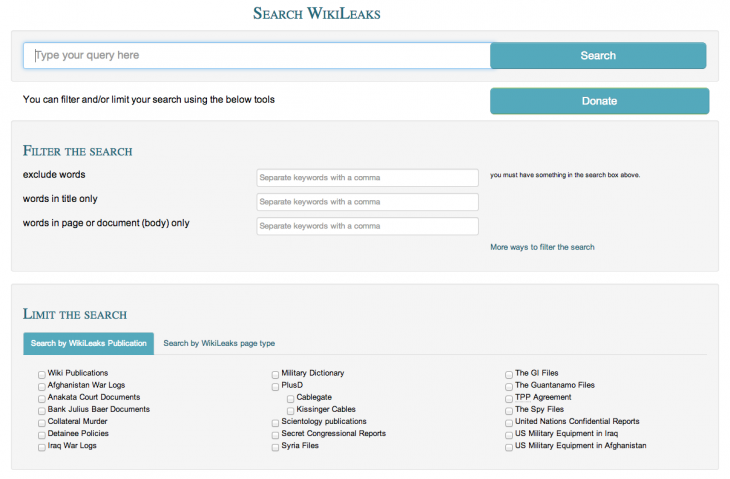 Filters allow you to request that Wikileaks ignore documents with certain words, or only if your search terms appear within the body of the page. A series of check-boxes, meanwhile, gives you the ability to find files from a specific WikiLeaks release, such as the Kissinger Cables. WikiLeaks was, until now, a daunting site for some people. A straight-forward search tool such as this one should go a long way to help newcomers leverage and learn from the mass of information that WikiLeaks now offers on the Web.